Did you know that new planets are discovered almost every day? Or that you can use a telescope to see millions of years into the past? From the planets and moons of our solar system to the farthest reaches of the universe, this book is an essential guide to the weird wonders of s... read full description below. Did you know that new planets are discovered almost every day? Or that you can use a telescope to see millions of years into the past? From the planets and moons of our solar system to the farthest reaches of the universe, this book is an essential guide to the weird wonders of space. 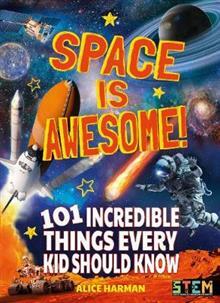 It is packed full of 101 extraordinary facts about space that kids will love to discover and share. For children aged 7+. Alice Harman is a well-respected author of children's non-fiction, specialising in science and geography.